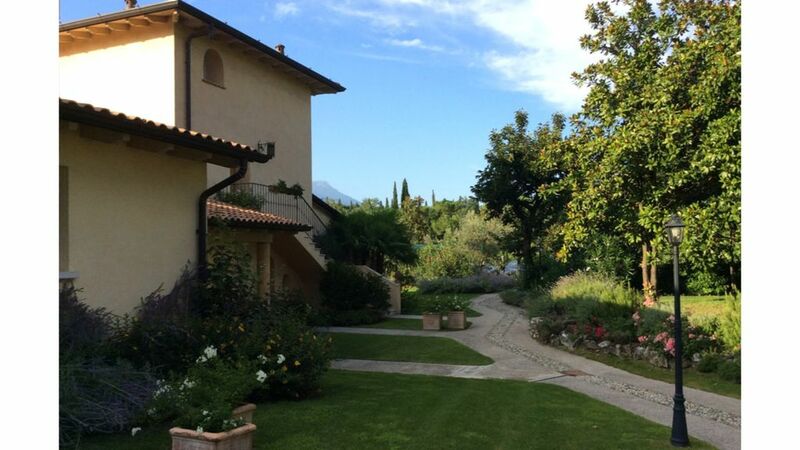 The Relais de Charme "Le Videlle" is located on the hills of Lake Garda in a privileged and quiet position surrounded by a park of 40,000 square meters. It is an oasis of perfumes, colors and silences, an ideal destination for those who want to find tranquility and refreshment in mind. The distance that separates them from the shores of Lake Garda is about 2 Km. Ideal for golf lovers, the Relais de Charme "Le Videlle" borders the "Il Colombaro" Golf Club, a 9-hole course and four other courses in the immediate vicinity: Garda Golf Soiano del Garda, Golf Bogliaco, Golf Palazzo Arzaga , Club Golf Paradiso. In a privileged position compared to the points of historical interest in Northern Italy: Milan, Verona, Venice, Florence, Bergamo and Brescia. In the park among several species of flowers and superb tall trees, there is a lovely swimming pool in mosaic and local stone. The apartment "TOPAZIO" is located on the ground floor, surrounded by a beautiful garden and surrounded by olive groves and vineyards, is located in a prestigious farm dating from between 600 and 700 where they are produced DOP oil and wines DOC of excellent quality. Independent entrance and panoramic view on one of the two natural ponds that are located inside the property.